Winner of the Parents Choice Award! "If you've ever had the pleasure of seeing Marylee with an audience of young children--then you know. She captivates them. The little ones sing, dance, jump, wiggle, clap and follow her like the Pied Piper. 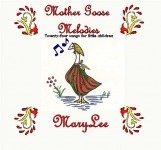 Marylee is the children's muse because she remains focused on the music, and so do the children. What she brings to live performances can be heard on her CD's as well. Clear vocals, lots of variety in tempos, instruments, nuance. Each song is crafted to please little listeners, keeping their attention, and they're easy on parents' ears, too." Below is a reproducable flyer of songs to perform with children at a Renaissance Faire. Categorized by ages and stages of children. Enjoy!